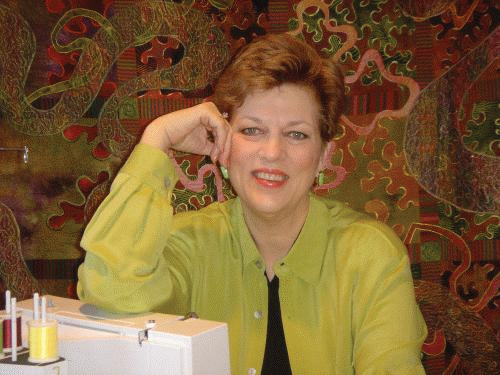 In August we announced that Community, a fabric line from Moda’s Collection for a Cause by Howard Marcus, would benefit quilter and teacher extraordinaire Libby Lehman as she continues to recover from a burst aneurysm and stroke. Another luminary from the quilting world, Marianne Fons, has taken the next logical step and created a quilt from the Community line and is offering you…yes, YOU…a chance to win it, and to benefit Libby at the same time. 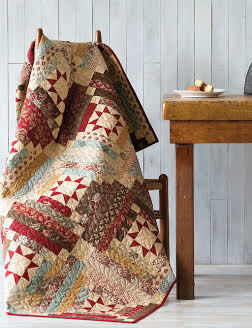 The quilt is 60″ by 75″ and is featured in the January/February issue of Love of Quilting magazine. (It’s also on display at Creekside Quilting in Clive, Iowa.) Marianne named it Libby’s Log Cabin and says she stitched it in recognition of Libby’s contributions as a quilter and a teacher, roles Marianne understands well. Libby is home and learning to speak and write again, and walks with assistance. The proceeds from the Community fabric line will help pay for her ongoing therapy and 24-hour caregivers, costs not covered by insurance. That’s what Marianne hopes her quilt will do, too. She’s offering anyone who makes a contribution in any amount the chance to win Libby’s Log Cabin. The winner’s name will be drawn from a hat by Marianne on Friday, February 13. If you’d like to enter to win, and help Libby at the same time, send a check made out to LIBBY LEHMAN MEDICAL FUND. I think Marianne’s words are so important, this could happen to anyone of us and I would hope to be helped and remembered by my friends. 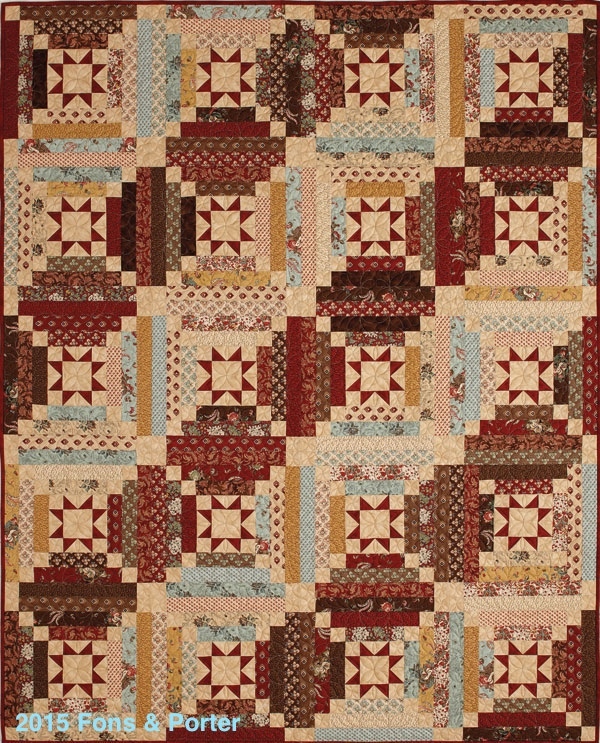 This quilt is lovely and the care and live that went into is sure to come along. Thanks for sharing the opportunity to give back to Libby. What a thoughtful post. I’m glad that Libby continues to improve with each passing day and that she is blessed with friends like Marianne. The ending quote was very powerful. What a generous thing for Marianne and Moda to benefit Libby’s recovery. Thank you for sharing this uplifting story. Thank you for this … wishes for Libby’s continued improvement. Quilt friends are blessings within our own communities but when we can reach out to help another we surely must. God bless! It is so true, one never knows what the future holds for us. Beautiful quilt and a grand gesture Marrianne. Sincerely, Paula K.
and Moda Fabrics, for honoring and helping my sweet sister, Libby Lehman, in such a kind and thoughtful way. I showed a picture of Marianne’s quilt made with Moda’s “Collection for a Cause” line of fabric, and she grabbed the picture and kissed it. “BEAUTIFUL”, she said. Libby is really on a “recovery roll”, made possible by the generosity of the Quilting Family which has enabled Libby to have much more therapy than would have been possible otherwise. She continues to improve everyday. Bless you all! I’m thinking I should quit teaching in the public schools and get me a job in the quilting world! #Dreamjob!